As I write this we are currently duplicating the Maundy Thursday, Good Friday, and Easter Vigil programs. Lent has gone by quickly this year, and it is hard to believe that this Sunday is Palm Sunday. Preparations are being made by many different volunteers for our Holy Week liturgies. Easter flowers have been organized, candles for the Easter Vigil were delivered last week, and tomorrow the palms will arrive. Another volunteer brought the eggs for the Easter egg hunt this morning, and we continue to receive donations of candy. The baptismal certificates for those being baptized on Easter Eve and Easter Day have been prepared, and the liturgies for Holy Week will be sent to the acolytes and readers soon so that they can prepare. There are so many moving parts to Holy Week, and no matter how early we start to prepare, we always discover new ways of being intentional with the whole experience. The work of preparation always fills the time that is available. Much gratitude is deserved to everyone who helped with our Lenten programs. The meditations on Wednesday nights prior to Stations of the Cross have been moving to hear, and John Condrey has done an excellent job of facilitating these sessions. I also want to thank the many cooks who made the Lenten suppers possible, as well as our multiple lay officiants at the Daily Offices and Stations of the Cross. St. Mark's has a deep bench of talent when it comes to worship leadership. Gratitude is also due to those who have helped with the Lenten Forums after the Sunday high masses, and these too have been well-attended. Last Sunday the choir hosted the final Lenten forum with an array of soups and breads, and we discussed the Jerusalem origins of the Holy Week liturgies that we pray today. The choir's hard work paid off, for the freewill offering at the luncheon will pay for the music at the Easter masses. And where there is prayer, there will also be outreach. The Sunday Supper Ministry keeps growing. What began as a small ministry run by me and Sandy Leialoha a year ago has now turned into a weekly operation involving a number of committed volunteers. A few months ago I was able to completely hand it off as now the laity have taken charge of every aspect. It has become an effortless ministry, and our houseless friends depend on it. With Holy Week upon us, the time is here for us to make room in our lives for these special liturgies. I encourage you to attend as many of the services as possible. Out of such a discipline will come great freedom in regard to the faith. 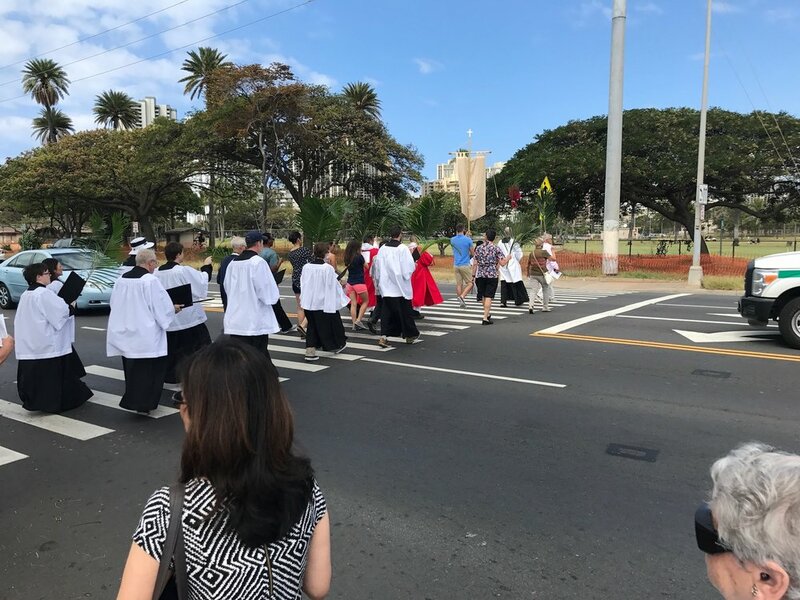 Whether it is the Palm Sunday neighborhood procession at high mass, the washing of feet at the Maundy Thursday mass, the veneration of the cross on Good Friday, the lighting of the new fire and baptisms at the Easter Vigil, or the glory of the Easter Day masses, all of these services teach the faith in their own special way. For most of the Holy Week liturgies this year, I will be the preacher. Good Friday is the exception, when Father Ben Newland will preach. Father Newland is our Monday celebrant at the noonday mass each week, and you can read more about him on the parish website. Amidst all of the Holy Week preparations, other work continues as well. Plans for the kitchen are moving forward, and other maintenance around the church is being completed. This Saturday is the March for Our Lives at the state capitol, and ministries throughout Eastertide are being finalized. Soon our celebrations of St. Mark will be here on April 25 and April 29. We will have a guest preacher for our patronal feast, and I will be announcing more about this in the coming days. This morning we had our weekly Bible Study. Of course, there is so much to do with Holy Week on the horizon, and yet it is always a blessing to put the details on hold, and go to Morning Prayer in our Mary Chapel, and then spend the remainder of the morning discussing the Sunday readings at the Bible study. Perhaps this is one of the best lessons Lent can teach us as we get ready for Holy Week - sometimes details should wait. Whenever we have the chance to pray, or study the Bible, or serve our neighbors, we should do it. Such prayer and service must always come first. As we enter into Holy Week, there will be many distractions for each of us. For now, let's do what matters the most. Let's worship God before all other things, so that Christ may minister to us through the liturgies of the coming days.